RD Interview: In the aftermath of the 2015 BRICS summit in Ufa, Fyodor Lukyanov, head of Russia’s Council on Foreign and Defense Policy, discusses how the BRICS are evolving in response to changing geopolitical conditions. The recent BRICS Summit, which took place in Ufa, Russia on July 8-9, attracted significant commentary in both the Russian and Western media about the expanding role that Russia and other BRICS nations – Brazil, India, China, and South Africa – hope to play in the world. While it would be overstating matters to say that the BRICS are creating an alternative geopolitical architecture for the world – recent steps such as the launch of the New Development Bank and a reserve currency pool suggest that the BRICS are taking steps to assert greater control over future geopolitical developments. With that in mind, Russia Direct interviewed Fyodor Lukyanov, an influential Russian foreign policy analyst and the head of the Council on Foreign and Defense Policy, for his take on the potential role that the BRICS might play in the world. As Lukyanov explains, the BRICS are fundamentally non-Western, but that does not imply that they are anti-Western. Russia Direct: What are the most important results of the 2015 BRICS Summit and what are their implications, especially for the West? Fyodor Lukyanov: Regarding the importance of the results and meetings, I would say that the influence of the BRICS is another sign of the gradual weakening of the West’s influence in the world. Particularly, such unhealthy attention that the BRICS attracts from the West indicates that the West is aware of its own weaknesses and is concerned that there will be alternative institutions. But they are emerging much slower than they could be. Nevertheless, the Western countries properly understand this trend. And they are not satisfied with this trend. RD: How do you assess the possibility of other countries such Pakistan or Iran joining the BRICS? F.L. : It is hardly likely because, first of all, the BRICS is not an organization in which it is possible to join and get a formal membership. It is a sort of club that mostly resembles the G7, a club that brings together countries that have common interests. The BRICS is a collective “non-West,” not the “anti-West,” but non-Western nonetheless. RD: The Kremlin hopes that the BRICS will be able to replace the West to boost its weakening economy, which is isolated from Europe, the United States and some other countries. Some even talk about the so-called technological alliance of the BRICS. Do you believe in it? F.L. : Well, the idea of a technological alliance of the BRICS requires a very serious and large-scale work. As a motto, it works well, but in practice, it does not. Even though if it could be possible to implement in some fields, again, it will require very painstaking work, for example, the search for common markets that could bring together joint intellectual and technological efforts. And it won’t be easy because, unlike Russia, which is restricted from the West’s technologies, the rest of the BRICS participants are not and they have a bigger space to maneuver, I mean, Russia will have to persuade them that it [the technological alliance] is really necessary for them. RD: The recent visit of the Brazilian president to the U.S. or the Chinese prime minister’s trip to Europe was interpreted by some as a weakness of the BRICS, showing that there is no ideal unity and both Brazil and China will prefer collaboration with the West. F.L. : Again, nobody [from the BRICS countries] says that they will reject collaboration with the West. It is counter-productive to put the question in this way. And Russia, likewise, won’t do it despite the current situation. And we don’t say that we boycott the West, and none of the BRICS will reject the West as well, because they have very close ties with it. RD: But can’t these close ties between some BRICS countries and the West lead to a split in the union, if, for example, there will be pressure from the West and, again, different interests, priorities? F.L. : The Western countries naturally will exert pressure, because every BRICS participant is a big regional power that has a very important position, which the West takes into account. And it is normal for international relations. 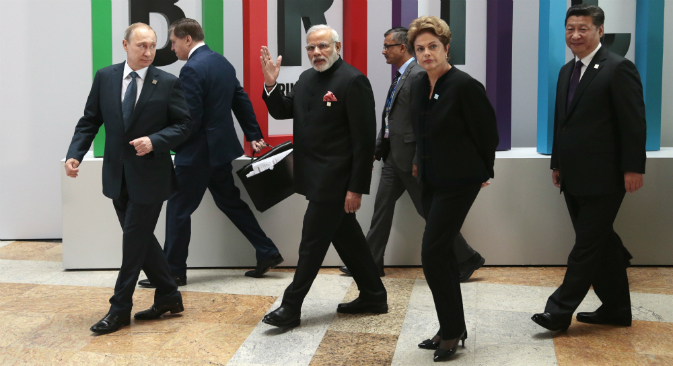 Yes, it might weaken unity in the BRICS – or it might not. Actually, it is a matter of the capability to establish good relations. But, again, we should base this on the fact that these countries are located not in a vacuum, but in the real world. And if somebody in Russia sees the BRICS as a sort of anti-Western alliance, where Russia will be a leading power, it won’t happen. Nobody needs such a BRICS. What are the major challenges for the BRICS? Who can be the leader in the group? Read the full story at Russia Direct. Would Hillary Clinton reset relations with Russia? ; BRICS: Credible rival to the G7 at last? ; SCO: No longer a ‘paper tiger’?